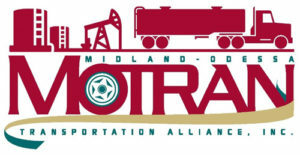 MOTRAN will be teaming up with the Texas Department of Transportation (TXDOT) and Texas A&M Transportation Institute (TTI) to research and develop a study that accurately accounts for truck traffic derived from oil and gas well development and production activity in the Permian Basin. MOTRAN will reach out to E&P operators, oilfield service providers, and commercial trucking companies with a request for information regarding trucking numbers associated with the development of a well from drilling to completions, and long-range production activities. Based on the input from these industry partners, we will develop a breakdown of items like an average number of trucks, type of trucks, and routes of the trucks. Once we have received data from industry leaders, we will aggregate the data to protect the identity of operators and then turn the data over to TTI to develop the research into a usable project study to paint a more accurate picture of the trucking impact the energy sector has in the Permian Basin. The final product will result in better data regarding traffic counts and help prioritize the most needed improvements to facilitate economic growth and improve safety conditions. Two years ago, we discovered that mileages associated with disposal of produced water, alone, were nearly half a billion miles more annually than TXDOT had estimated for total truck traffic in the Permian Basin. That’s why this project is so important, and why your help is critical. Better data will likely lead to a larger share of formula funding, resulting in more infrastructure dollars coming back to the region in which generated those funds, and ultimately ensuring that we accomplish the most with these limited funds.